Cara seting printer epson L385 driver dan wifi - Epson kembali meluncurkan varian baru printer All in one (sacn, print,copy) dan di lengkapi teknologi wifi sehinggga memudahkan kita pabila kebetulan saat di rumah tidak ada komputer maka kita bisa langsung melakukan pencetakan dokumen atau foto dengan secara wireless menggunakan gadget android kita, kali ini masbilal akan mencoba membagikan pengalaman tetang cara seting printer epson L385 dan wifi nya. Sebelum kita memulai cara seting printer epson L385 mengkin ada baiknya kalau kita tau spesifikasi dari printer ini, printer epson ini dengan kondisi tinta penuh bisa mencetak sebanyak 7.500 lembar hasil cetak berwarna atau 4.500 lembar hasil cetak hitam, epson L385 memiliki kemampuan menghemat tinta tetapi dengan kualitas yang sangat baik karena printer ini menggunakan teknologi on demand ink jet (pieso electric) dengan konfigurasi nozle hitam 180 dan nozel berwana 59, selain koneksi USB untuk mencetak printer ini juga memiliki konektivitas wifi untuk mencetak dokumen atau foto secara wireless tetapi untuk interface dengan device wifi lain printer ini memerlukan router dengan kemampuan WPS sebagai penghubungnya. 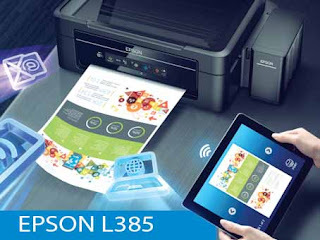 Epson L385 harga nya di jual di market place seperti tokopedia, bukalapak,dll di lego mulai harga 2,6 jutaan dan berdasarkan para pembelinya Epson L385 review nya cukup bagus untuk hasil printernya tetapi ada beberapa pengguna yang kesulitan untuk mengkonfigurasikan wirelessnya karena itu masbilal akan mencoba membagikan tulisan tentang epson L385 wifi setup dan cara konfigurasinya. Untuk pemasangan awal sebaiknya kita menggunakan CD bawaan dari printernya dan mengklik aplikasi Epson setup Navi (apabila aplikasinya tidak otomatis jalan) dan konfigurasi bisa langsung di jalankan mengikuti petunjuk langkah perlangkahnya tetapi bagi anda yang belum memiliki CD instalasinya anda bisa mendownloadnya aplikasi resmi epson di sini. Bila anda memang tidak memiliki CD instalasi dan memilih mendownload aplikasi instalasinya sesuai link di atas anda akan di berikan pilihan untuk memilih driver printer, driver scanner dan setup navi, anda bisa memilih driver printer dan driver scanner saja untuk penggunaan fasilitas printer dan scanner nya tetapi bagi anda yang akan menggunakan fasilitas wifi maka sebaiknya anda mengunduh setup navi karena setingannya lebih mudah dan jangan lupa untuk memilih sistem operasi sesuai komputer anda karena takutnya website epson tidak bisa mendeteksi sistem operasi komputer anda. Epson L385 tidak menunjuk salah satu merk atau model router tertentu untuk pengkonfigurasian wifinya yang penting routernya memiliki fasilitas WPS. Anda mungkin bertanya kenapa harus dengan fasilitas WPS karena WPS sendiri akan menyambugkan jaringan secara otomatis terutama ketika proses pendeteksian printer dan komputer ketika awal di hubungkan. E-1 ❏ Make sure that the Ethernet cable is connected to the printer, a hub, or other network devices. ❏ Make sure that the hub or other network devices are turned on. E-2 ❏ Make sure that the access point is turned on. E-3 ❏ Check that the computer or other devices are connected correctly to the access point. E-7 ❏ Place the printer close to the access point. Remove any obstacles between them. ❏ If you have entered the SSID manually, check if it is correct. Check the SSID from the Network Status part on the network connection report. ❏ To establish a network using push button setup, check that the access point supports WPS. If it does not support WPS, you cannot establish a network using push button setup. ❏ Check that only ASCII characters (alphanumeric characters and symbols) are used for the SSID. The printer cannot display an SSID which contains any characters other than ASCII characters. ❏ Check the SSID and password before connecting to the access point. If you are using an access point with its default settings, the SSID and password are on the label. If you do not know the SSID and password, contact the person who set up the access point, or see the documentation provided with the access point. ❏ When you want to connect to an SSID generated using the tethering function on a smart device, check the SSID and password in the documentation provided with the smart device. ❏ If the Wi-Fi connection is suddenly disconnected, check the following. If any of these are applicable, reset the network settings using the installer. ❏ Another smart device was added to the network using push button setup. ❏ The Wi-Fi network was set up using any method other than push button setup. E-5 Make sure the access point's security type is set to one of the following. If it is not, change the security type on the access point, and then reset the printer's network settings. * : WPA PSK is also known as WPA Personal. WPA2 PSK is also known as WPA2 Personal. E-6 ❏ Check if the MAC address filtering is disabled. If it is enabled, register the printer's MAC address so that it is not filtered. See the documentation provided with the access point for details. You can check the printer's MAC address from the Network Status part on the network connection report. ❏ If the access point's shared authentication is enabled on the WEP security method, make sure the authentication key and index are correct. E-8 ❏ Enable DHCP on the access point when the printer's Obtain IP Address is set to Auto. ❏ If the printer's Obtain IP Address is set to Manual, the IP address you manually set is out of range (for example: 0.0.0.0) and it is disabled. Set a valid IP address from printer's control panel or Web Config. ❏ Devices are turned on. ❏ You can access the Internet and other computers or network devices on the same network from the devices you want to connect to the printer. ❏ Other devices on the network are turned on. ❏ Network addresses (IP address, subnet mask, and default gateway) are correct if you have set the printer's Obtain IP Address to Manual. Reset the network address if these are incorrect. You can check the IP address, subnet mask, and default gateway from the Network Status part on the network connection report. When DHCP is enabled, change the printer's Obtain IP Address to Auto. 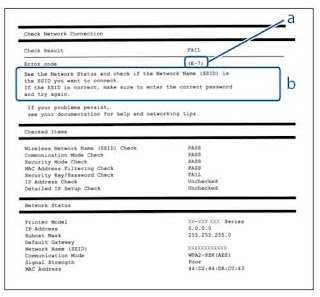 If you want to set the IP address manually, check the printer's IP address from the Network Status part on the network connection report, and then select Manual on the network settings screen. Set the subnet mask to [255.255.255.0]. ❏ The default gateway address is correct when you set the printer's TCP/IP Setup to Manual. ❏ The device that is set as the default gateway is turned on. Set the correct default gateway address. You can check the default gateway address from the Network Status part on the network connection report. ❏ The network addresses (IP address, subnet mask, and default gateway) are correct if you are entering them manually. ❏ The network addresses for other devices (subnet mask and default gateway) are the same. ❏ The IP address does not conflict with other devices. If it still does not work after checking the above, try the following. ❏ Make network settings on the computer that is on the same network as the printer using the installer. ❏ You can register several passwords on an access point that uses the WEP security type. If several passwords are registered, check if the first registered password is set on the printer. ❏ Network devices such as an access point, hub, and router are turned on. *Multiple network names (SSID) that match your entered network name (SSID) have been detected. Confirm network name (SSID). The same SSID may be set on several access points. Check the settings on the access points, and change the SSID. The Wi-Fi environment needs to be improved. Turn the wireless router off and then turn it on. If the connection does not improve, see the documentation for the wireless router. After moving the printer closer to the access point and removing any obstacles between them, turn the access point on. If it still does not connect, see the documentation supplied with the access point. *No more devices can be connected. Disconnect one of the connected devices if you want to add another one. You can simultaneously connect up to four computers and smart devices in Wi-Fi Direct (Simple AP) connection. To add another computer or smart device, disconnect one of the connected devices first. 0 Response to "Cara Seting Printer Epson L385 Driver Dan Wifi "